Life With 4 Boys: Mars Needs Moms Clips and Prize Pack Giveaway! Mars Needs Moms Clips and Prize Pack Giveaway! 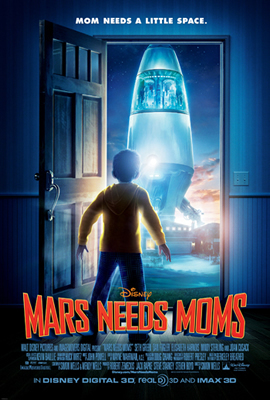 I mentioned before that Disney has a new film coming out in 3D entitled Mars Needs Moms. This movie looks like a real blast from what I have seen of it and I know that the boys are itching to go see it in the theater when it comes out on March 11th. Below you will find some Mars Needs Moms clips that will help get you excited for the films debut, as well as a great prize pack giveaway! "Take out the trash, eat your broccoli—who needs moms, anyway? Nine-year-old Milo (Seth Green) finds out just how much he needs his mom (Joan Cusack) when she’s nabbed by Martians who plan to steal her mom-ness for their own young. Produced by the team behind “Disney’s A Christmas Carol” and “The Polar Express,” “Mars Needs Moms” showcases Milo’s quest to save his mom—a wild adventure in Disney Digital 3D™ and IMAX® 3D that involves stowing away on a spaceship, navigating an elaborate, multi-level planet and taking on the alien nation and their leader (Mindy Sterling). With the help of a tech-savvy, underground earthman named Gribble (Dan Fogler) and a rebel Martian girl called Ki (Elisabeth Harnois), Milo just might find his way back to his mom—in more ways than one." * No compensation was received for this post. Disney provided the prize pack for giveaway, but all thoughts and opinions expressed here are my own. My kids would miss me taking them to McDonalds. My son would miss spending time with him. My kids would miss the clean laundry and food! I'm sure he would miss me putting him to bed at night! And of course hugs and kisses. My boys would miss my early morning Happy Dance. They would miss me cooking for them. My kids would miss all the things I do for them every day and all the fun times we have together. My kids would miss me reading to them. Probably clean laundry and cooked food! They would miss my buttermilk biscuits. They would miss the yummies I bake! Today it was banana bread...yum!